Over several decades the Costa Del Sol has developed into one of Europe’s premier holiday destinations based largely on its climate which provides around 300 sunny days per year with hot, dry summers and mild winters. Malaga airport is the key gateway to the region which attracts more than two million annual visitors. Most of the tourist development has taken place to the west of Malaga as mega resorts have grown out of what were no more than fishing villages in the 1960s. The main resorts include Torremolinos, Benalmadena and Fuengirola which are very close to the airport. Further along the coast lie Marbella with its famous marina at Puerto Banus, Estepona, Sotogrande and finally Gibraltar where the Costa del Sol comes to an end. Tourist developments to the east of Malaga are mainly geared towards domestic tourism until you reach the popular resort of Nerja which attracts mainly foreign visitors. Malaga Airport lies 13km south-west of the city centre of the city of Malaga in the south of Spain. With over 14 million passengers passing through its terminals it is Spain’s 4th busiest airport and serves as the gateway to the holiday resorts of the Costa del Sol. The airport has three terminals with flights to more than 100 European destinations and many cities in Spain. The Irish budget airlines Ryanair offer many routes to and from Malaga whilst the Spanish low-cost carrier, Vueling, also have a major presence here. Transport services to Costa del Sol holiday destinations include buses, trains, taxis and a number of private transfer options. One of the most common questions we’ve been asked over the years of running this is website is “What will the weather be like on the Costa del Sol in MONTH”. Ten years ago I’d have confidently been able to give you a fairly reliable answer but in these days of global warming I tend to sit on the fence if people are visiting during the off season as weather patterns have certainly changed and can’t be predicted with the certainty of not so long ago. Having said that you’re not likely to have any great problems with the weather if you’re heading down to the south of Spain during the summer months. The tourist brochures don’t lie when they claim that this region gets over 300 days of annual sunshine, so you’d be very unlucky to have anything but great weather during July and August. June and September aren’t necessarily as reliable but again it’s fair to say that you can expect great weather during those months. In temperature terms you can expect it to reach around 30ºC during those peak summer months with little or no rain. The odd summer storm is often a welcome respite from the soaring heat. Personally I’d aim to visit the region in May, June or September when temperatures are still very nice but with the added advantage that places are often more relaxed outside school holidays. Golfers often refer to the region as the ‘Costa del Golf‘ which isn’t surprising considering conditions for the sport are idyllic and attract players all year round. Certainly May, June and September are great months for golf tourism but the region is also popular during the winter months when daytime temperatures average around 16ºC. For holidaymakers there’s an element of luck involved in what your weather will be like during these off peak months. Daytime temperatures will most likely be very pleasant with a bit of a chill in the evening. As for rain, you never know. Rainy days certainly occur during the winter and are fairly unpredictable though they rarely last more than a few days. Not much use if you’re only there for a week I suppose! In summary … peak summer (July/August) will most likely be fabulous weather, May, June and September are usually some of the best months to visit, and the winter is generally very mild but rather unpredictable. To get a general picture of what you can expect take a look at these two graphs which show temperature and rainfall figures all year round. Benalmadena – Lying a short distance south west of Malaga airport between the famous resorts of Torremolinos and Fuengirola, Benalmadena has plenty to offer the whole spectrum of visitor types. Estepona – Estepona is the most westerly resort of the Costa del Sol. It has avoided too many of the high rise blocks of many of the other resorts and is an ideal choice for those people looking for a quiet holiday. Fuengirola – The third major high rise resort heading south from Malaga, Fuengirola is especially popular with British tourists of all ages especially families and middle aged groups. Malaga – Malaga is the stepping stone to the Costa del Sol. Relatively few visitors visit the city as they rush from the airport to their holiday resort. In doing so they miss a gem of a city with a fascinating old quarter next to a Roman theatre and Moorish palace, a commercial centre with first class shopping and a vibrant social life. Marbella – Famous as a playground of the rich and famous, Marbella is now accessible to many who swarm south to enjoy the Spanish sunshine and the world class golf courses of the Costa del Golf. Mijas – Mijas Pueblo stands high up the mountain above the coastal resorts and is a popular ½ day excursion from the Costa del Sol whilst Mijas Costa is the resort on the coast below which attracts mass tourism to its many attractions. Nerja – Nerja is the most easterly resort of the Costa del Sol which still somehow maintains a reputation as a quaint village. This is no longer the case as the inevitable tourist developments have transformed the town into a thriving resort but without the high rise excesses of the western Costa del Sol. Puerto Banus – Puerto Banus was established long ago as a favourite haunt of Europe’s jet set. Today it is still home to multimillion dollar yachts and flash cars but is also open for business to everyone. Sotogrande – Sotogrande marina is the first port of call for yachts entering the Mediterranean. It is also home to two of Europe’s finest golf courses including Valderrama which hosted the 1997 Ryder Cup. Torremolinos – During the 1950s and 60s Torremolinos was converted from a quaint fishing village into the Costa del Sol’s original tourist resort. Today it is a concrete jungle but with fine beaches and ample accommodation it has plenty to offer. The climate of southern Spain is such that golf can be played all year round which has turned it into one of the world’s great golfing destinations . With more than seventy courses to play on, excellent accommodation options first class tourism infrastructure the Costa del Sol attracts golfers from all over the world. There are so many things to do on the Costa del Sol thanks largely to its extensive coastline which is conducive to water based activities. Every resort caters for its visitors with a variety of pastimes such as kitesurfing, scuba diving and even dolphin and whale watching. The local markets which take place in different resorts each day always prove popular with visitors. For something more cultural you can take full day excursions to the great Moorish cities of Seville, Cordoba and Granada or shorter trips into Malaga and Mijas or to the lovely town of Ronda. Other popular tours include Gibraltar and Tangier in Morocco which is only a short catamaran journey across the the Straits of Gibraltar. 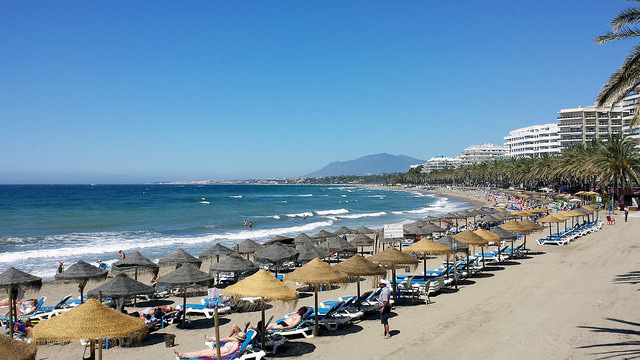 There is hotel accommodation on the Costa del Sol to suit all tastes and budgets. Below we’ve provided links to hotels and other accommodation in the main resorts. Torremolinos is the longest established of the Costa del Sol’s large tourist resorts. It lies just a few minutes from Malaga airport and is large enough to be able to offer hotels and apartments to suit all tastes and budgets. Benalmadena is the nearby neighbour of Torremolinos with a wide range of hotels you would expect to find in any major Spanish holiday resort. There are plenty budget options as well as luxury apartments on purpose built urbanisations and 5 star hotels with Casino. Further west comes Fuengirola which has experienced huge development such that today the resort extends for some 10km along the coastine with intensive developments of hotels and apartments creating one of Spain’s mega-resorts. Marbella was one of Europe’s first playgrounds for the rich and famous. Today it is less exclusive but still remains a better class of resort town. The central area offers a great number of hotels and apartments near excellent beaches whilst the quaint old town remains intact. 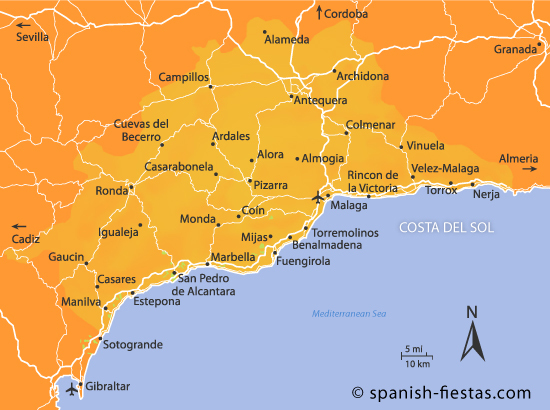 Estepona is 75km from Malaga airport and is the most westerly of the Costa del Sol’s main resorts. Accommodation is plentiful but the town has managed to avoid the worst of large scale property development with less high rise hotels and apartments than further east. Malaga has long been the stepping stone to the Costa del Sol as millions of annual visitors arrive at the international airport there. The city itself is slowly getting itself on the map of Andalucia’s top city destinations especially since the recent opening of the Picasso Museum. Nerja is the most easterly of the Costa del Sol resorts and is quite distinctive having prevented high rise property developments. It is a very pleasant, upmarket destination with a good selection of accommodation including some fine hotels and modern apartments. For a comprehensive list of available hotels all over the Costa del Sol take a look at Booking.com’s listing. Marbella and Puerto Banus have long been recognised as the jet-set capital of the Costa del Sol where many celebrities from around the world are owners of luxury villas. For those of us without the means to buy luxury holiday homes there are plenty affordable villas and apartments available for short-term holiday lets in this area. A great way to enjoy the Costa del Sol is to arrange a private rental then pick up a hire car at Malaga airport. This provides you with return transfer from the airport and the flexibility to take some great day excursions to the likes of Ronda, Gibraltar, Cordoba and Seville. 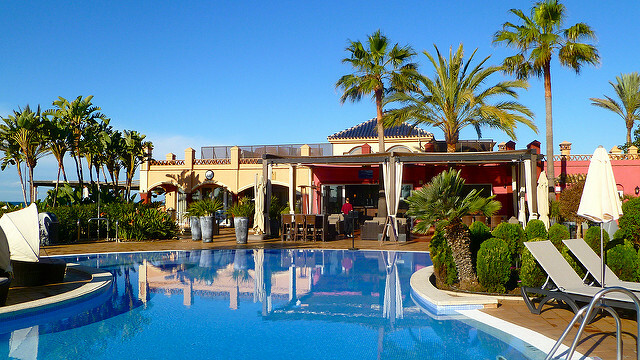 For othere a private villa rental is an ideal way of staying in close proximity to a range of world class golf courses.